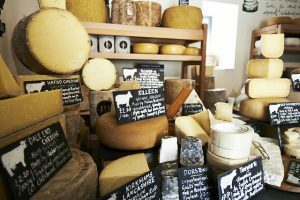 Home Learn About Cheese Cheese Musings & Tips What is a ‘washed-rind’ cheese? And why do they smell? Well ‘washed-rind cheese’ does exactly what it says on the tin: the rind of the cheese is washed during the maturing process. After the cheese has been moulded and formed, it is matured. 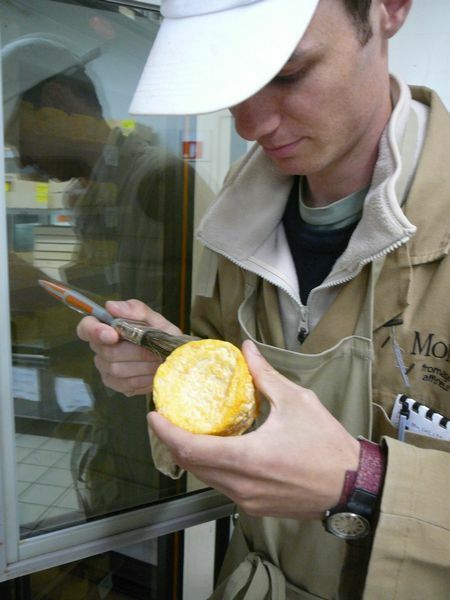 During this maturation, the outside of the cheese is moistened (washed) gently with a damp cloth or brush, sometimes regularly, sometimes only once or twice. The washing solution is often brine (salt-water), but various alcohols are used instead, such as beer or brandy. This washing process changes the make-up of the cheese. Instead of moulds and bacteria that like drier, less ammoniated and less salty conditions (like the white mould on Brie and Camembert), a bacteria that is more tolerant to humid, ammoniated, salty conditions starts to grow on the cheese. On washed-rind cheese, the notable bacteria is called brevibacterium linens but there are many others*. Two things typify this bacterium: its colour (orange and golden to ruby-red), and its smell (often, but not always, pungent). The smell is caused by the bacterium producing sulphur-compounds as it grows. But don’t be afraid! Washed-rind cheeses have a bark worse than their bite. The strong smell will often give way to gentler, subtle flavours as soon as the cheese is in the mouth. The edible rind is a key contributor to the flavour of washed-rind cheeses, and often contributes powerfully, so it’s important to taste the rind to make your own judgement. Aside from the washing and creation of the red-pigmented, smelly rind, there are no other particular rules to define a washed-rind cheese. Some are firm, others oozing. 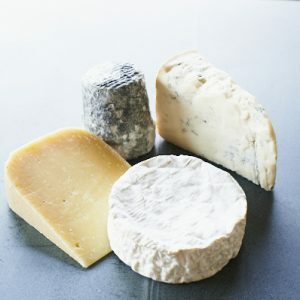 Most cheese styles have their key characteristics formed during making, but washed-rind cheeses gain their characteristics post-making because the washing is carried out as part of the ageing. This leads to a great diversity in the styles, textures and flavours of washed-rind cheese, ranging from the firm, nutty Gruyère to the strong, smelly Livarot. When most people talk about ‘washed-rind’ cheeses, however, they usually mean the softer, more pungent varieties. Washing the rind of cheese came about in two areas – the lowlands (softer cheeses) and the mountains (harder cheeses). The softer cheeses were made primarily on the French lowlands by monks (and are thus often called monastery or Trappist cheeses). They are also called ‘smear-ripened’ cheese, because the bacteria were often ‘smeared on’. They came about because the monks made cheese and stored it in their humid, ‘close’ cellars, which were already ripe with ideal ammoniated conditions for the bacteria. As the cheeses dried out and began to crack, and maybe start to develop unfavourable rinds, the monks would have washed the cheese in whatever they had to hand. Usually alcohol! Well, beer and low-alcohol spirits to be precise: in the days before clean drinking water this was the only thing safe to drink. And hence the washed-rind cheese was born. With these softer monastery cheeses, the bacteria will break down the cheese to make it more creamy and oozier as it ages. 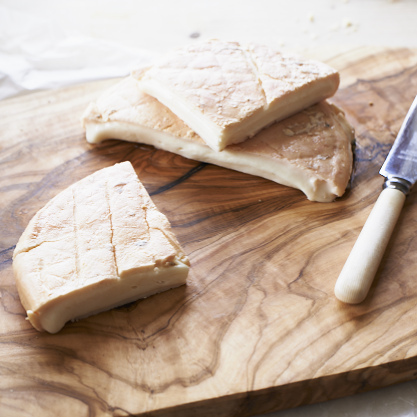 Avoid browning rinds, and dry or cracked rinds, though – they are too old. A soft washed wind should be plump and the rind bright and moist, almost tacky, but not too sticky or slick. Not that some producers nowadays will often add bought-in bacteria and sometimes even a little colouring (annatto) into the wash to help the rind form its colour and characteristics. The other area where washed-rind cheese came about is up in the mountains, where the humid, damp environments cause unfavourable moulds to grow. This led to washing the cheese with brine (not having the lowland problems with water quality) to restrict the grey and brown moulds and also to help add salt to the cheese. For the technical-minded among you, washed-rind bacteria were aided by the favourable conditions that both the Alps and the monastery-style cheeses have, creating cheeses that are naturally less acid. The acidification is reduced by using milk fresh after each milking on a daily basis, heating up the curd, and making the cheese fast rather than slowly. And although brevibacterium linens is very salt-tolerant, it doesn’t like acid conditions so favours cheeses with a higher pH. Contrast that with traditional Brie and Camembert, where the farms were small and the milk was often kept overnight and acidified slowly – not ideal conditions for brevibacterium. Some acid cheeses, however, grow yeast on the rind before washing, which de-acidifies the rind, so the washed-rind bacteria can populate (e.g. Langres). This is why these cheeses are often deemed higher risk – they have lots of moisture and low acidity, which are critical control points for lower-risk cheeses. Washed-rind cheese is a style of cheese that seems to divide customers. Above all it’s the smell that usually puts people off. But if you can get past the ‘stink’, washed-rind cheese is a meaty, savoury beast that should be included on any decent cheese board. And although its native home may be France, Britain and Ireland nowadays produce an array of lovely washed-rind cheese – look out for St James (Andy’s favourite), St Oswald, Milleens and Ardrahan. Famous washed-rind cheeses that exhibit the classic characteristics include Ami du Chambertin, Epoisses, Gubbeen, Herve, Langres, Limburger, Livarot, Maroilles, Munster, Pont l’Eveque, Reblochon, Stinking Bishop, Taleggio and Vacherin. Other cheeses that have their rind washed, and you probably didn’t realise it, include Beaufort, Comté, Gruyère, Morbier, Ogleshield and Raclette. 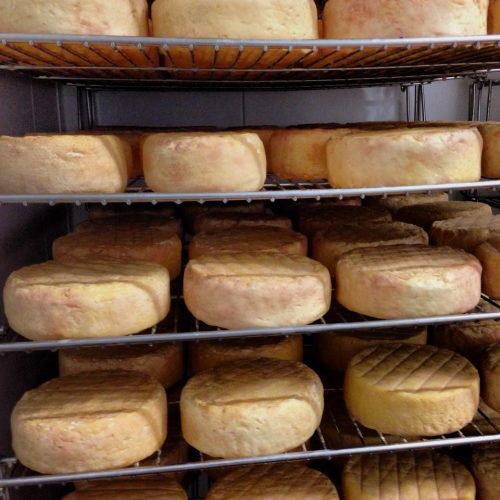 Click here to view The Courtyard Dairy’s soft & smelly cheeses.